Our 20" trapeze bar has an embossed design for better hand hold and strength.It has triple-coated corrosion resistant layers of zinc, chromate, and a clear polymer seal.The bar is 19.5" from center to center of the eyebolts.Diameter of the bar is 1".You can use the H140 - 145 - 150 - 160 - 165 - 172 with this.This product should last 2 years in harsh conditions and up to 5 years in optimal conditions.Some conditions may require replacement sooner.Tensile strength 1200 lbs. 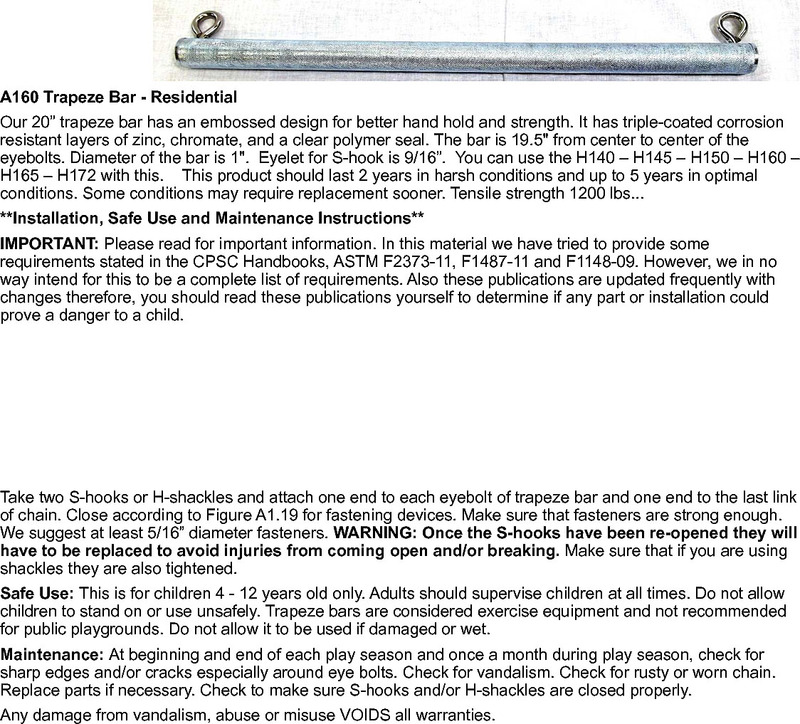 Take two S-hooks or H-shackles and attach one end to each eyebolt of trapeze bar and one end to the last link of chain.Close according to Figure A1.19 for fastening devices.Make sure that fasteners are strong enough.We suggest at least 5/16" diameter fasteners.Warning: Once the S-hooks have been re-opened they will have to be replaced to avoid injuries from coming open and/or breaking. Make sure that if you are using shackles they are also tightened. Safe Use: This is for children 4 - 12 years old only.Adults should supervise children at all times.Do not allow children to stand on or use unsafely.Trapeze bars are considered exercise equipment and not recommended for public playgrounds.Do not allow it to be used if damaged or wet. Maintenance: At beginning and end of each play season and once a month during play season, check for sharp edges and/or cracks especially around eye bolts.Check for vandalism.Check for rusty or worn chain.Replace parts if necessary.Check to make sure S-hooks and/or H-shackles are closed properly.